It’s alright to say, I love you both! Who do you love more — your fiancée or your craft beer? No need to answer! The Arizona Craft Brewers Guild doesn’t want to make you choose. In fact, the guild is hoping you can combine your loves this coming February. On Valentine’s Day, Feb. 14 (just a reminder, guys), at 12:30 p.m., one lucky couple will walk down the aisle at the 15th annual Strong Beer Festival. The catch? They will only have 24-hours notice until beer glasses start clinking and wedding bells are ringing. 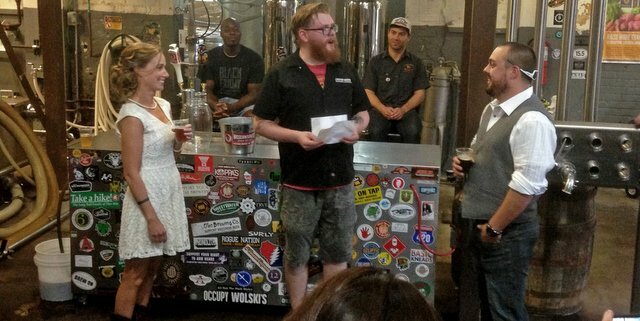 It’s called the Arizona Craft Brewers Guild’s “Hop Down the Aisle” Impromptu Wedding, and couples from across the state of Arizona are encouraged to submit their love story. The result could mean a free wedding (50 guests! ), free wedding dress, free honeymoon, free beer and getting married by an actual ordained brewer. Whether the story is heartwarming, hilarious, peculiar or all of the above, the Arizona Craft Brewers Guild wants to hear how you fell in love. After the judges deliberate between contenders, selected applicants will be invited to come down to Scottsdale Beer Co. on Feb. 9 from 10 to 12 p.m. A panel will then select the lucky couple, who will be notified on Feb. 13. With only 24 hours’ notice, the bride and groom won’t have much time to wrap their head around the excitement. However, the only thing they need to worry about is which craft beer they will drink first as a married couple. Camera crews will follow the bridal party through the day to capture every moment. Interested in winning “A Hop Down the Aisle?” Please remember to submit your story by Feb. 1 to [email protected] and follow all guidelines to ensure your love story is qualified. If you can survive this, you’re meant to stay together for life. Getting married?? Love beer?? Then this, my friend, won’t sound so queer!!!…. Get your pens and win this here! !..